Most of the problems caused in Software are due to human errors or Complexity in Software functions. These problems always get resolved with each new release of Software. That’s why we always have to keep close eye on Software’s release notes or issues fixed list. Some problems that we face while working with a Software are due to lack of our knowledge or not using it correctly . Learn some of the ‘Troubleshooting Tools and Techniques’ of AutoCAD from CadOasis to cope with those problems. We will be adding new Troubleshooting tools and techniques for AutoCAD here only ! So keep visiting this page. This is the first thing you must know to use AutoCAD. you can also find AutoCAD recommended Hardware . For any genuine problem or more information always trust help files made by Software publisher, they solve almost 70% of your problems. Some Display issues which are related with Drawing Area or UI are due to Graphic card Problem. 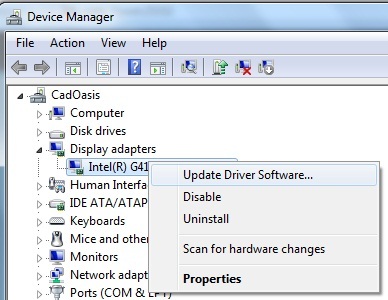 Always install Latest/Recommended Graphics card in System Requirements. If some of the dialog boxes like New, Open, Save or Export are not pop up and Command options shows in Command line then Run Command: FILEDIA if Default option is set to 0 then Change it to 1. 5. Lineweight not showing in Model or Layouts .